We created My PSC Exec to help high-earning contractors who like to look ahead. It includes all the benefits of My PSC, plus business insurance, Self-Assessment tax returns, tax investigation protection service and tax advice service, quarterly company health checks and in-depth tax and financial planning for you and your family. Not to mention the peace of mind that comes with knowing you’re making well-informed decisions about the future of your finances. My PSC helps you to set up and run your own limited company in the most tax-efficient way possible, with minimum fuss. So you can get on with what you do best. Including help with opening a company bank account, registering your company for PAYE, VAT and Corporation tax, plus access to comprehensive insurance packages. Make expense claims and get a real-time picture of your company finances any time, quickly and easily via smartphone. 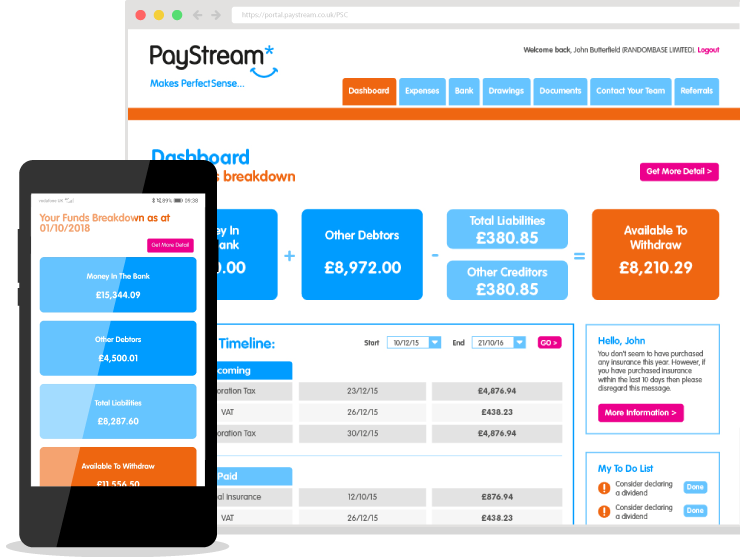 Get an instant snapshot of your company finances 24/7, with a tax timeline showing how much tax is due and when to pay HMRC, record your expenses, view your latest bank transactions and much more. Unlimited all year round accountancy support and tax advice from specialist contractor accountants. Including real-time management accounts, weekly income statement and bookkeeping, unlimited sales invoicing, assistance with routine HMRC correspondence and tax liability reminders, plus much more. Including quarterly VAT returns and PAYE payment notification. Online real-time portal which shows your company tax liabilities and a personal tax calculator showing your forecast personal tax liability. Including annual statutory accounts, Corporation Tax return, real time information, P60, P11D and free confirmation statement. Helps you to work in the most tax-efficient way. An initial IR35 review then unlimited reviews on future contracts and general advice to keep you on the right side of IR35. Up to £10m employer’s liability, £5m public liability, £5m professional indemnity and personal accident cover. Every month, we give 3 lucky winners prizes worth hundreds of pounds and these winners will be drawn at random in a monthly prize draw. Get help securing that mortgage, loan or other financial product with our experienced partners, Haven Global Strategies Ltd, who work with and understand the contractor market. Our specially-designed online accounting portal helps you shine a light on your company finances quickly and conveniently, whenever you want. Only for My PSC and My PSC Exec contractors. An overview of your company’s performance, your current and projected position for personal tax, and recommendations on how you can better manage and plan your finances. This includes £10m employers’ liability, £5m public liability, £5m professional indemnity and personal accident insurance. Our Tax Team will ensure your return is completed accurately and on time, chase any overpaid tax you may be due, and give advance warnings of your potential tax liabilities. This is available for both you and a second shareholder, if you have one. Our in-house tax experts will provide full professional help and advice if you are ever the subject of an HMRC tax investigation. Our in-house tax experts are on hand to offer help and support on any tax query you may have that will be tailored to your specific circumstance. Your very own personal financial advisor will not only advise you how to take forward any identified tax efficiencies, but also help you to put them in place, in a seamless and painless process.